Just like the inside of your house, there are times when you think you need to do something different to the garden. It doesn’t matter how big or small your garden is, just by changing a few things, you can transform it into something different. However, it can be hard to imagine what you can do to make it the way you want. Here are a few tips that will be able to help you decide. Before you start your new design, you need to know where you are going to put everything. It is a good idea to start with a blank page and add all the areas of the garden you want to keep. Once you have done that, you can begin adding new features and planning the design. Try to keep it all to scale and think about how people will be able to get around the garden. You should also add a seating area and somewhere to sit with friends on those warm summer days. When you have finished with the planning, you will be able to think about the design details. For some people, their lawn is the biggest part of their garden. It can be used for so many things such as a play area for the kids and a relaxing spot to read and enjoy the sun. However, just because it’s a lawn, doesn’t mean that it has to be square or rectangular. Think about other designs you can have for your lawn; you can even try to extend it into other areas of the garden but try to give it some character. You also need to think about the health of your lawn, if it’s looking bare and is more mud then grass, you might need to give it some major attention. You can go for the seeding option where you spread grass seed on the lawn and try to help it regrow. However, this doesn’t always work as birds can eat the seed or your lawn might be too far gone to recover. In those cases, you might want to start again and have the area turfed. Although having your garden returfed is more expensive, it will make a big difference straight away. 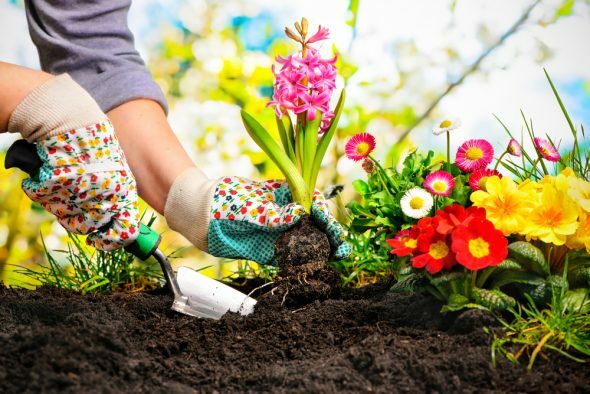 Along with your lawn, the next best thing will be your flowers and shrubs. Whether they are in pots or flowerbeds, they are the things that will give your garden life and color. If you are thinking of completely renewing your plants, then try to pick ones that will complement each other as well as those that will grow in the conditions your garden supplies. For example, if you have a shaded area of your garden, then try to pick flowers and shrubs that won’t mind the dark and will be happy with a slightly wetter ground. If you want to keep your flowers, then try to add additional plants where you can, so that it looks different. If you have a big garden, you could try adding a tree to give you some height, along with a nice place to sit under. Trees can also be a nice reminder of your time in a house as it grows with your children. Having pathways in your garden is a great way to lead people to other areas that you want them to see. It is also a good way to prevent your lawn or flowerbeds becoming trampled. The paths don’t have to be straight and, in a row, in fact, you want them to be winding their way through the garden, so people think they are being led on an adventure. You can have a path leading to a secluded spot in the corner with a seat and a water feature or leading back to the house and the patio area. The materials you use for your path will depend on your preference, but you want something that will allow the water to drain through it, so it doesn’t get slippery in the rain. You want a garden that you can use and also sit in and admire, but you also might want an area where you can have friends and perhaps the odd barbeque. For these areas, you are going to need decking or patios as they are the best surfaces to use for furniture. When it comes to decking, there are many sites where you can see composite decking comparison. It gives you a good idea of the types of decking you can have depending on your taste. Patios are usually similar in that you can have bricks of slabs in various colors and designs. Both are hard wearing; it just depends on the area you have and your personal preference. If you are going to all the trouble of redesigning your garden, you need to have a good seating area to admire the result. Seating in the garden is one area where you need to get good quality. The better it is, the longer it will last and the more resistant it will be to the elements. You also need to plan to have enough for your family plus additional seating you can use for guests. The extra chairs don’t have to be out all the time; you can buy folding ones which you can store until needed. As well as seating, you will probably want a table so that you can rest drinks and snacks. If you are planning on eating outside in the warmer weather, then you could also get a dining table and chairs that are weatherproof. Of course, it depends on how much space you have in your garden and seating areas. With a little planning, you should be able to create a whole new look in your garden. If you have a small garden and you don’t want grass, then these ideas will still work, though you can swap the grass for slabs or stones.